Has it really only been twelve days since we welcomed Big Sister home? In some ways it feels like yesterday (the days blur together); yet in other ways, it feels as it she has been part of our family much longer. Something about transitions completely amazes me. It is like watching life unfold in slow motion, yet moving at warp speed. Like holding a magnifying glass up to our household, when I dive into certain moments I can see pieces beginning to fit together: relationships forming, bonds growing, personalities figuring out how to work with each other. While this time is just the beginning of our new life together, I also believe it is such a critical and fragile time. Big Sister comes to us from a very broken background. "Of course!" you might say. "She was an orphan, so that implies brokenness." Yes, certainly her previous orphan (current princess) status implies some sort of devastation that led to a child being separated from her or his birth family. However, as I have learned and continue to learn, there are levels of brokenness. Each child's personal history and personal composition, consisting of personality, gifts, strengths, weaknesses, etc. help to determine where exactly on the broken road the child was before being scooped up and set on a new path, a path that would eventually lead her home to us. With that in mind, this transition is a unique experience, as your transition will be as well. As the primary caregiver, I have to be cognizant of everyone's past, everyone's uniqueness, and also our collective dynamics. It is more art than science, but observation, heartfelt, compassionate observation is key, in my opinion, to making the transition a smooth as possible. Sporty, the current oldest by only nine months (after trumping Larry as the oldest in 2011), is feeling a bit unsure of his new role and perhaps even a smidge jealous at times of being 'challenged' by Big Sister. This uncertainty has led Sporty to step it up around the house when it comes to chores, being responsible, and attempting to lead. This uncertainly has also led him to, at times, include Big Sister and welcome her and at other times push her away. There is a push-pull dynamics going on and therefore I see it as my job to encourage him to pull her in, include her, and work together as the big kids in the house. When they play together, it makes my heart happy! Larry is over-the-moon-excited to have a big sister. He claimed her as his new best friend in the house and is already talking her ear off. Big Sister welcomes the attention, says she loves him, but also stated that he "talks a lot". Moe is still in a not-so-fun ornery three-year-old stage. He is whiny and has a hard time accepting 'no' these days. He is almost four years old and so this is just where we happened to land developmentally when Big Sister arrived. She loves Moe and can make him laugh easily. I'm sure his whining annoys her...which reminds me that I need buy her a pair of noise reduction headphones. Welcome to preschool mania, Big Sister! Sassy is equally thrilled to have a big sister. She also claims Big Sister for herself and has repeatedly told me, "That is my sister!" I have had to assure Sassy that Big Sister in indeed her sister, but is also a sibling to the others. This statement was welcomed with a pout and a a grunt. Big Sister whips Sassy's hair into beautiful rows and braids and they seem to enjoy each other's company. Big Sister is patient and kind. She is quiet and somewhat reserved. She proceeds with caution into new environments and told me that it takes her time to warm up to new people and places. Most importantly, she seeks me out and embraces me as her mom. Only God! Big Sister participates in family time and events. She plays and makes an effort to join in. However, she also needs frequent retreats from the day's activity. There is so much to take in and I know this is a very emotional time for her. When Big Sister needs alone time, she goes to her room, puts on some music, and either reads or rests. I give her some space, but make sure to check on her frequently so that she does not feel alone. Finally, I have observed that we are coming together quite nicely. Like the title says, everyday we're shuffling. We have to take things in stride, expect the unexpected, and be flexible enough to make changes on the fly. Everything is still so new for each one of us. We shuffle through the events of the day, and before you know it we will be a new cohesive unit. I think our new unit resembles our old one, but we now have a slightly new character and flavor. Big Sister's hurtful past has made me reexamine some of our ways of doing business. This is actually a big part of the reason I am taking a "word fast" next week. I want to make sure my words are healing across the board. She deserves nothing less. As we continue shuffling forward, I pray for each one of us to make a more conscious effort to calm down and break out the compassion in abundance. She needs to feel safe and welcome and secure. She is so amazingly brave and has been through so much that I want us to go the extra mile in terms of welcoming her home. With five kids, I cannot promise serenity, but we can all definitely benefit from working toward a greater calm in our home. 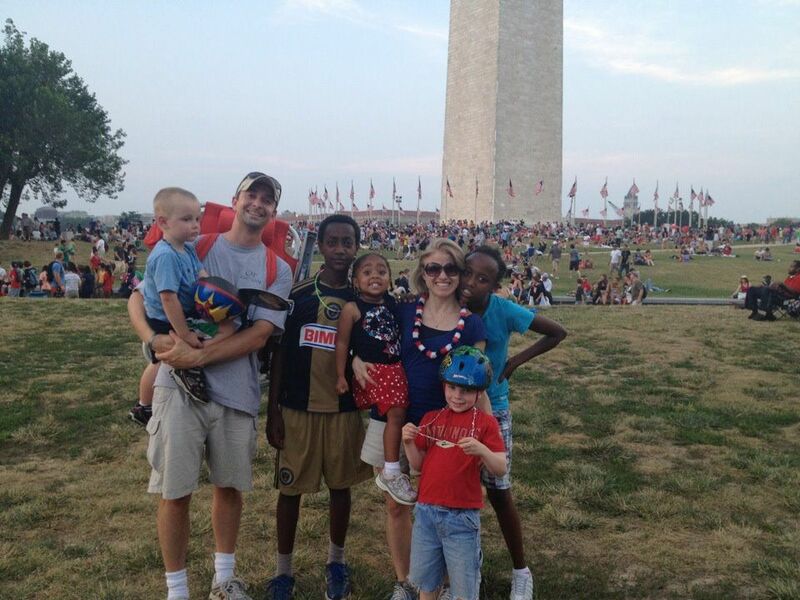 Yesterday, we celebrated Independence Day. Our family joined a group of amazing people to tailgate, enjoy food, fellowship, and games. 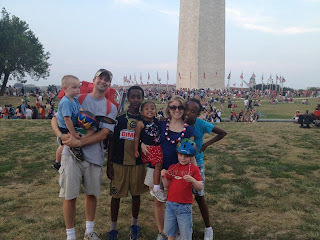 Then, we walked and (the kids) scooted into the city to partake in the celebration and fireworks, with DC's lights and monuments forming a majestic backdrop. As the fireworks were booming and lighting up the night sky and the kids were smiling from ear to ear, I sat amazed at the fact that eleven short days earlier, Big Sister was living on a compound without the love of a family. Now, she was surrounded by her family's love and the love of her community. Two weeks ago, I was wondering what she was doing from moment to moment. Now, I had the privilege of watching her run and play and enjoy life with the hope of brighter days to come. It reminded me that God is always a God of second chances and that you just never know when you could be the avenue to someone's second chance. Now matter how dark and messy one's past is, he is our Rock and Redeemer and the one who showed us how to love others as ourselves. Until Christ returns to brings his plan to completion, our Christian faith tells us that we are to be Christ to the world. There is no other way. By carrying one another's burdens we are all showered with spiritual blessings and are able to enjoy the peace of Christ, which surpasses all understanding.